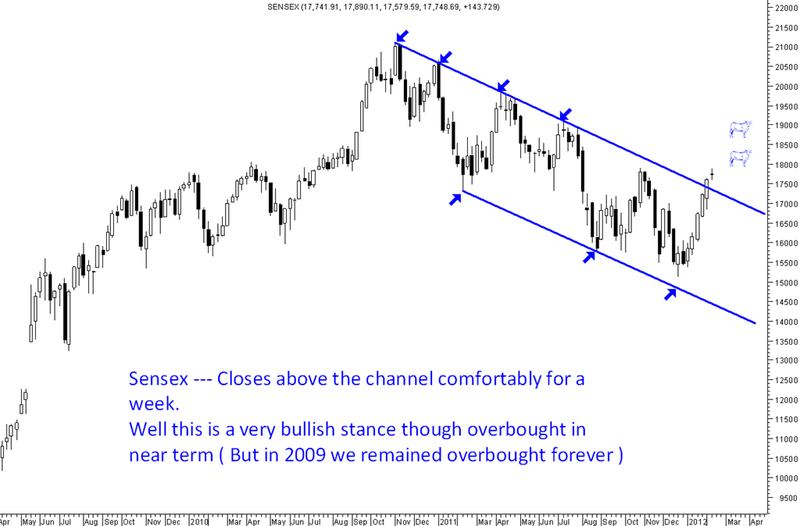 Sensex — Its not Over till its Over. No point fighting the trend. As sticking to my view that there is no point buying a breakout above 5200 on the channel but the real time was to buy at 4700-4500 which gave you supreme buy opportunity. Now if we look at he chart purely on technicals without having a view that index has moved from 4500 to 5400 and stocks have jumped 50% or more etc. All i see is a clean Channel Breakout and a sustained closing above it for a week. Also i see a doji which gives me caution but needs to be validated by a break below 17500. Yes the markets do look overbought and with negative divergences ! but the whole of 2009 was the same 😛 so no point fighting the trend and shorting without any reversal signs ( stock specific shorts have killed with a 30% jump ) . As many people could not time the bottom so now all Analysts have been trying to time the top (:P well we did too at 5180 🙂 got hit and since then have been following the trend which is clearly up) which will give good amount of supports to the market on dips as consensus is still pretty bearish. Strategy : Technically short term supports at 5200/5330 upside resistance now directly shifts to 5600-5700. But with so many people calling a correction it will take its own time 🙂 focus on specific stocks as expected the momentum to shift to midcaps/smallcaps and selective upmoves will continue. Also defensive stocks with good value will perform with time. BOC India has moved from sub 300 to 400 without any effort. Disclosure: We continue to remain pretty much invested with a little cash generated coz of partial profit booking and increase in the value. 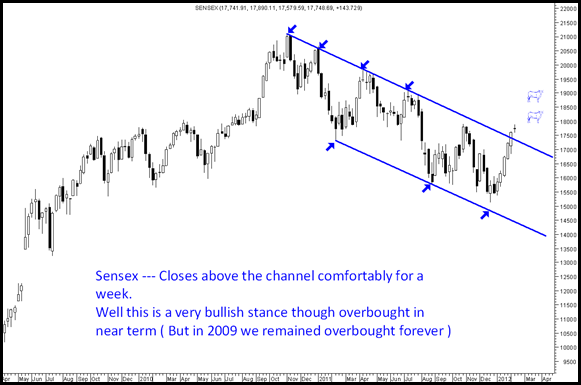 Also had been employing a lot of leverage at lower levels in the trading recommendations. January was by far the best month !! in terms of monthly returns. Also buying specifically into stocks in an accumulate mode.